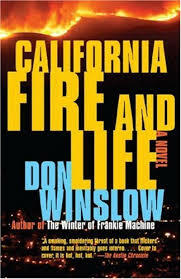 I usually enjoy Winslow but because this is a stand-alone it’s a bit different. The 1st person protagonist is a Jack Wade, a former fire investigator for the police, but having got in trouble there he now works as a claims adjuster for “California Fire and Life.” He’s very good at his job. A seriously expensive, incredibly beautiful and antique filled home with ocean view has burned to the ground. A young gorgeous woman died in the fire – she had apparently been drinking and smoking in bed. But a little further investigation shows that she was divorcing her husband who had taken the kids that night, their little dog was found outside the home, it was insured for the max. The prologue tells us that there were Russians and Asians are involved as well as some low-life American boys. In the Prologue it’s apparent that a lot of evidence is being destroyed material as well as human. The husband of the dead woman is Russian as is his aging imperious mother so there’s really no mystery except for the connections and denouement. It’s a great story and interesting to have an insurance adjustor as the lead investigator, but the tale gets a somewhat bogged down in background and feels a bit choppy. Also, the love story is not quite believable. Still – for all its flaws – it’s a fun read – enjoy.